The function of marginal abdominal tubercles is not fully understood, although ant-attended species often have large tubercles, suggesting they may be points of purchase as ants grasp the aphids in their mandibles. 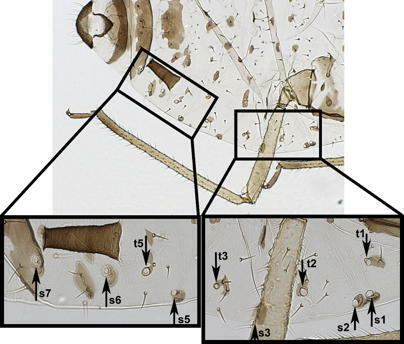 The distribution of marginal tubercles on the aphid's abdomen can help identify aphids. For example, species in the tribe Aphidini, including Aphis and Rhopalosiphum have tubercles on abdominal segments 1 and 7. Although other aphids may have marginal abdominal tubercles, they do not have them on both segments 1 and 7. Marginal tubercles are sometimes difficult to distinguish from spiracles. 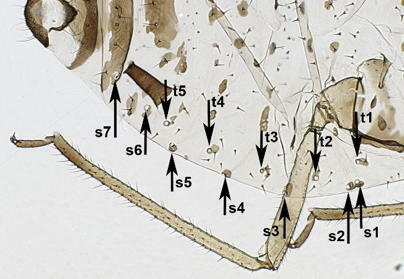 Tubercles are located on this aphid on abdominal segments 1 through 5 (labeled t1-t5). Spiracles are located on segments 1-7 (labeled s1-s7). 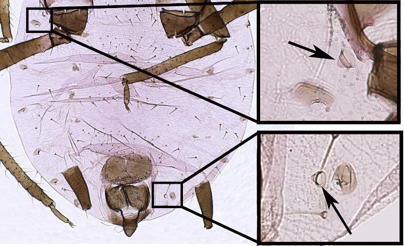 The lack of tubercles on both abdominal segments 1 and 7 is a key feature in AphID. Here, although there is a tubercle located on abdominal segment 1 (labeled t1), there is no tubercle on segment 7. Note that tubercles are labeled t1, t2, t3, and t5, whereas spiracles are labeled s1-s3 and s5-s7. The presence of marginal tubercles on both abdominal segments 1 and 7 is important to identifying some aphid species. The possible presence of tubercles on other segments does not effect the importance of these particular tubercles. Close-up images of a tubercle on the left side of abdominal segment 1 and a tubercle on the right side of abdominal segment 7 (black arrows). Note also the nearby spiracle in both cases.